We often receive calls from clients whose Fargo ID card printers display a “wrong ribbon” error. This error will appear on the printer’s LCD screen or on the user’s computer monitor and has a few potential causes. Occasionally, we find that there is a hardware fault with the printer, particularly with the ribbon sensor or RFID-tag reader. After ruling out the other possible problems listed below, please call one of our experts if you still receive the “wrong ribbon” error. You could, indeed, have the wrong ribbon for the printer. Many Fargo ribbon cartridges look identical, and there are no markings on the ribbon carriers to indicate which you have. For example, a YMCKO ribbon for the Fargo DTC1250e looks like the YMCKO ribbon for the DTC4250e, but they are not interchangeable. Each ribbon has an embedded RFID tag which includes a ribbon part-number. The printer’s corresponding firmware includes a list of all ribbons that are compatible with the printer. As a result, if your ribbon is not compatible with your printer, you will receive this message. Fargo ID-card printer ribbons are manufactured to include an RFID tag, which contains information about the ribbon itself (ribbon type, lot number, manufacturing site, etc.). On VERY rare occasions, this RFID tag is missing, or the data has been corrupted. This will prevent the printer from recognizing an otherwise good ribbon as valid. Try another ribbon if you have one available. You could have out-of-date firmware on your printer. Periodically, Fargo will introduce new firmware to include updated manufacturing information. Once this new firmware is introduced, they will include new data on the encoded RFID tag affixed to the ribbon cartridge. A printer with outdated firmware will be unable to validate ribbons that have this new encoding and reject them, returning a “wrong ribbon” error. Please see our separate blog post “Fargo Printers How-to: Update your Drivers and Firmware” for detailed instructions on updating firmware. But most-likely, the error is the result of an incorrect print-driver setting. For example, you may have a full-color (YMCKO) ribbon, but a print driver set for a monochrome-black (K) ribbon. This mismatch between the actual ribbon loaded, and the ribbon the PC “thinks” should be loaded will result in a mismatch, and “wrong ribbon” error. For this scenario, follow the directions below to change the printer driver settings. Prior to beginning the instructions below, please verify that you have Windows administrator rights or have been granted Windows permissions by your network administrator to change the driver functions on your computer. Without these elevated privileges, you will not be able to make these changes. Click the “Apply” button in the lower-right, and then click “OK” to finish and close the Window. 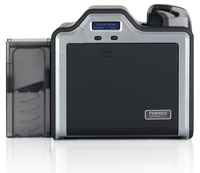 Fargo ID-card printers are manufactured by HID Global. For information about Fargo printers, contact us for a free consultation toll-free at +1 888.485.4696 (US & Canada), or +1 704.535.5200 (elsewhere). This entry was posted in Fargo Printer, Safe-Card ID Tech Tips and tagged Fargo Printer, Fargo technical assistance, wrong ribbon, wrong ribbon error on January 29, 2016 by SafeCard ID Team. HID Global, a leading manufacturer of ID card printers and security products provides a over the edge printer that exceeds the standards of the majority of ID card printers on the market. The following video illustrates the features of this rugged printer. The printer shown is available in single and dual sided options. Other options include high security elements such as standard and custom holograms for a single side or both sides of the printer, mag stripe encoding, smart card encoding and more. If you have specific questions about how this Fargo card printer can meet your organizational requirements, please contact our ID card experts at 888-485-4696. We would be happy to provide information about the Fargo HDP5000 to ensure you receive the correct printer system for your upcoming ID card program. This entry was posted in Video and tagged Fargo Printer, HDP5000, Video on April 26, 2012 by SafeCard ID Team. 2. On the HID support web page, select the HDP5000 card printer from the dropdown list. 3. After selecting the printer choice from the “What type of product?” list, a new list, “For what product”, will appear. Select HDP5000 from this list. 4. After selecting the HDP5000 printer, click the Go button. 5. Under the printer driver section, scroll down to the HDP5000 Macintosh Driver and click in it to download the driver. 6. Select the Save file and click the OK button. Your web browser settings will determine where the file is downloaded on your computer. 7. When the HDP5000 V1.0.0.4.pkg.zip finishes, you can close the Downloads window. For more information about the Fargo HDP5000 printer or other Fargo printer models, contact our ID card experts at 888-485-4696. This entry was posted in Fargo Printer and tagged fargo driver, Fargo Printer, HDP5000, Mac Driver on March 2, 2011 by SafeCard ID Team. A breakthrough in direct to card printing, the Fargo DTC printer/encoders are illustrated in the following HID Global produced video. These new printers produce a fantastic ID card at an affordable price point. A powerful printer for high volume printing. For a free consultation with an ID card expert about these new Fargo printer models, contact our sales and service at 888-485-4696. This entry was posted in Fargo Printer and tagged DTC1000, DTC4000, DTC4500, Fargo Printer on September 30, 2010 by SafeCard ID Team. It is important to keep the Fargo card printer clean to provide professional quality ID card printing for years to come. When cleaning the printer, follow the steps below to ensure the printer is cleaned correctly. 1. Open the printer front cover. 2. Remove the print ribbon. 3. Squeeze the printhead cleaning swab to saturate the tip of the swab with alcohol. 4. Rub the swab gently back and forth over the length of the printhead. 5. When the printhead is completely dry, replace the ribbon and close the front cover. 1. Open the printer front cover and remove the print ribbon. 2. Remove the cards from the printer’s input hopper. 3. Use the cleaning card from the cleaning kit and remove the adhesive backing from both sides of the card. 4. Insert the cleaning card into the single feed card slot until the card stops. 6. Click on the “clean printer” button. 7. Click on the “clean” button. At this point, the printer will pull in the cleaning card. The printer will perform an automated cleaning. Occasionally, use a cleaning pad from your cleaning kit to remove dust and dirt from inside the printer. Use a cleaning pad from the cleaning kit to remove dirt from the outside of the printer. For information about the Fargo HDP5000 printers or other Fargo printers, contact us for a free consultation at 888-485-4696. This entry was posted in Fargo Printer and tagged cleaning, cleaning instructions, cleaning kit, Cleaning the printer, Fargo Printer, printer clean on August 13, 2009 by SafeCard ID Team. Our Fargo DTC525 printer has a problem. Our front panel buttons do not work. The LCD display is fine, however. It sounds as if your front panel control is not working. You need to have a service repair provided on the printer. Contact your solutions provider for details on repair procedures. For additional information about the current Fargo printer models, let our id card experts provide you with a free consultation. This entry was posted in Fargo Printer and tagged Fargo Printer, Fargo technical assistance on January 2, 2009 by SafeCard ID Team. We have a Fargo Printer. Generally the print quality on the card is good and there are no lines or streaks like that indicating print head damage. We do get what I can only call a smudge on the first 1/2 inch of the card. Any ideas? You might go to the print driver settings to change the way the printer prints the card. This can be found in the printing preferences. Go to the device options tab and choose “rotate front 180 degrees”. Then print a card. This may fix the problem. If not, try downloading the latest print driver from Fargo. If the problem persists, contact your solutions provider for technical assistance or the Fargo Technical Support line at 800-459-5636 for specific repair information. This entry was posted in Fargo Printer and tagged Fargo Printer, Fargo Technical Help on December 29, 2008 by SafeCard ID Team. When we turned on the printer and wanted to print a self test, the LCD display provides a please wait message for quite a long time. Nothing is happening with the printer. What is the issue? If you are running the self test from the LCD panel on the printer and not from the print driver on the computer, you may have a problem with your main control board in the printer. This entry was posted in Fargo Printer and tagged Fargo 525, Fargo Printer, Fargo Printer Technical Assistance on December 12, 2008 by SafeCard ID Team. We have a Fargo Printer. When we turn the printer on, in continues to restart rather than going to the main menu on our LCD screen. The printer booting sequence does not complete and continues to restart. We are unable to print at all. We would recommend to try to update the firmware for this printer from the Fargo website. Update the print driver to the most current version from this site as well. Run a test card from the LCD panel if the printer starts after your updates. If successful, run a test card from the print driver on the computer. This entry was posted in Fargo Printer and tagged Fargo Printer, Fargo technical assistance on December 5, 2008 by SafeCard ID Team. We have a Fargo DTC525 printer. The PVC cards we use do not feed off of the hopper. What steps do we take? Make sure that your hopper card thickness gauge (located on the right side of the hopper) is set to 30 ml or above if you are using standard 30 ml PVC cards. It is also recommended that you clean the printer with a Fargo printer cleaning kit for this printer. Also check to make sure to check your PVC cards. Sometimes they have too much static and can stick together not allowing them to feed. Fan the cards before placing them back in the hopper to make sure they are not sticking. In this process, try not to touch the printing surface of the cards as oils from skin will cause defective printing results. This entry was posted in Fargo Printer and tagged fargo dtc525, Fargo Printer, Technical Assistance on November 24, 2008 by SafeCard ID Team.